What's one of the most annoying things about Microsoft Office? How difficult it is to keep track of all the documents you have open. Wouldn't it be nice if you could see them all as separate tabs, in the same way you can see different Web sites in a browser? With Office Tab Free (free), you can do exactly that. It comes in a 32-bit and a 64-bit edition. Office Tab Free lets you see multiple documents in Word, Excel, or PowerPoint, each in their own tab. Install the simple Office Tab Free add-in, and then when you're in Word, Excel, or PowerPoint, any time you open more than one document, it will open in its own separate tab. You get to see all of your open documents in a single glance. Go from tab to tab by clicking; close a tab by clicking the X in its upper corner, just like you do in a browser. You've got plenty of options for customizing the way that Office Tab Free works. 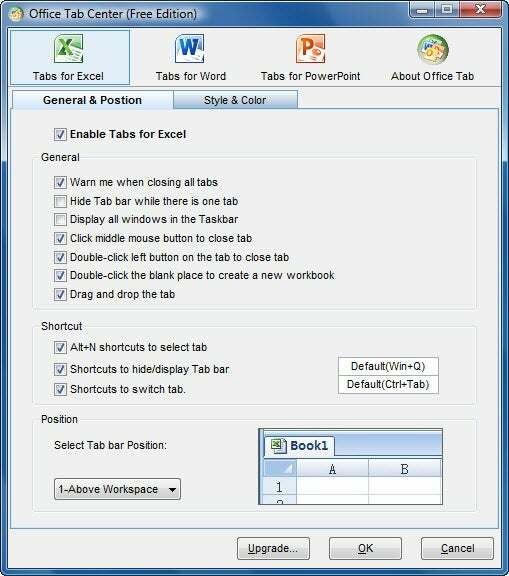 Click the file tab on the Ribbon, then choose Word Tab, Excel Tab, or PowerPoint Tab, depending on the application you'll using, and you'll be able to turn Office Tab on or off, and customize it many different ways. So you can set shortcuts for selecting tabs and switching tabs, you can change tab styles and colors, and more. And if you have each of the supported Microsoft applications open, Office Tab Free will work in each one. This version of Office Tab is free for non-commercial, personal use, and works only with Word, Excel, and PowerPoint. Businesses can buy a for-pay version of Office Tab. The free version also does not have some features that the $25 version does, such as closing all tabs with a single click, or saving all documents with a single click. If you need Office Tab to work on Project and Visio as well, you'll need the $35 Enterprise version. If you're the kind of person who often has multiple documents open in Office, you'll want to make sure to get Office Tab Free. It's a great time-saver.